You Shouldn’t buy a Scottish Fold! Not until you have a clear answer to to the questions bellow. Otherwise it is highly possible that your fold will end up in a pet shelter or worse abandoned & alone. People who abandon pets are not strange bad people. They are the neighbour next door. It can happen to anybody if he hasn’t done a good preparation before he or she decides to welcome a new pet into his or her house. This is probably the most neglected one. Almost no one thinks of allergies when he is about to buy a new cat or dog. The truth is that in our age allergies are widespread and many people suffer from them. It is advisable that before anything else you go run a test for cat allergies. If you don’t fancy the idea of hospitals and labs you should at least expose yourself in a cat environment. Go and stay with a who owns a cat, or borrow one’s cat for a few days. Not For Everyone, Do You Have What It Takes? You should then think if you are the kind of person who can tolerate a stubborn Scottish fold in his life. Owning a Scottish fold can be tiring and sometimes exhausting. Scottish folds tend to live more than 10 years, so don’t think yourself just today, think yourself living with the fold 10 years from now. Patiences, affection, love and devotion are 4 keys you definitely will need. Love, affection and devotion is the price you have to pay for a cat highly sociable, friendly and people oriented as the fold. For some people this is a sweat price to pay, for others it is unbearable and tiring. 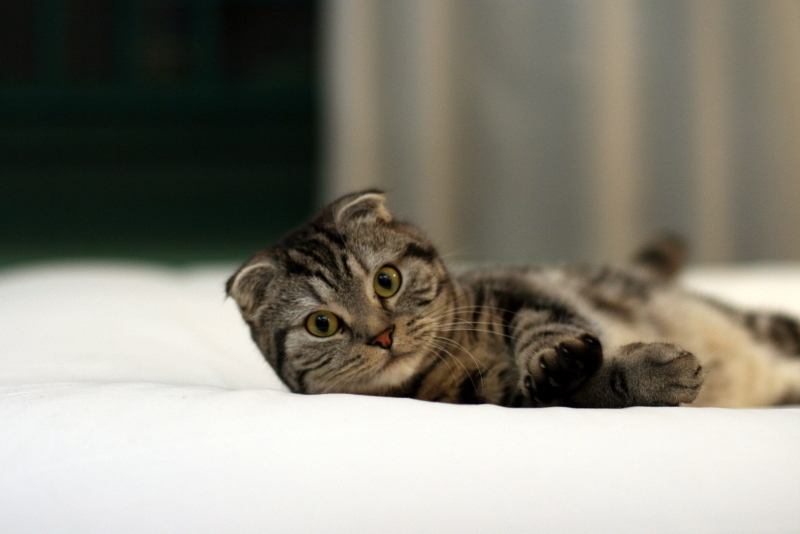 There are 3 kind of Scottish folds. Straight eared, which are the one who don’t carry the gene for folded ears. Folded eared, which carry only one copy of the gene ( aka Heterozygous). Folded eared again, but these carry two copies of the gene that makes the ears fold. Why do we care? We care, because the stronger the expression of this gene the higher the possibility the cat will develop osteochondrodysplasia. Homozygous Scottish folds (both of their parents are also scottish folds), are a no-no and it has been show that all of them develop osteochondrodysplasia. If you want to go for the folded eared kind, make sure you have a reputable breeder that provides health insurance. If you adopt a kitten or a cat from a shelter, have a vet examine the cat for any signs of stiffness, especially in the tail. If possible to an X-ray too. Apart from these, you should know that this breed of cat is extremely adaptable. This means that if you are planning to bring in your household more pets, or if you already have other pets, the folds will be OK. This is also true with kids, scottish folds are very friendly and you will hardly meet any problems between them and your kids. Scottish folds also adapt well on different environments, making them perfect for people who like to do frequent gatherings and travel a lot. This is a note to anyone who hasn’t any cat or dog or any kind of pet before. You may think you have everything it takes to become a Scottish fold owner. Good starting intentions are not enough, because once you buy it, the you have full responsibility for his/her life. The well-being of this animal is in your hands. It it suffers it’s your fault. If it is happy and healthy, again it is your fault. Having a pet is similar to having a child. You have responsibilities that you can not throw away. Since you are committed enough let’s see what are the must have before you buy your kitten. You will definitely need kitten food & some treats so you can easily train and reward your fold. Also you will need at least two bowls for food and water. There are many variations for feeding stuff for cats, even automatic feeders. A litter is also necessary, so your fold can have a private rest room. It is fairly easy to be trained to use it, so don’t worry about that. You may want to buy a bed or a blanket, or you may choose to make one. You will need to buy a scratching pad, or something similar, unless you want your furniture scratched. Last but not least are brushes and combs as well as clippers and trimmers for your new pet grooming needs. If you want, you can buy some toys too. Overall Starting Cost: $70 ~ $700 or more depending on the quality of the products you will use. Last but not least are services you’ll need as a cat owner now. There are two services you will need as a Scottish fold or any other cat owner. The first and most important is the veterinarian. It is very important that you do a good research before you take your pick. Folds need special care and treatment in order to avoid problems in older life. The other services you might need is a grooming salon. Grooming salons can be a very nice relieve from a procedure that some people are bored to do. But there is a catch. Grooming salons for cats have a very bad reputation. Mainly because there have been stories around the net that they don’t treat the cats well. If you are about to use a service like this make sure you know the owners and even the stuff personally. If your cat dislikes going to the salon this is also an indicator that has a bad time over there. That’s all, now you know, you are equipped with knowledge so you can have no regrets when you buy your first fold. Happy shopping and don’t forget to share and like the article!